Can we ask you to keep a secret? The designer and publisher of Federation Commander also created another game called Star Fleet Battles. That game has been in print for three decades and is the best-selling starship combat game of all time. It is also much more complicated than Federation Commander, although some people really like it despite its thousands of pages of rules. That game includes many space empires with different weapons and systems. Until the publication of future Federation Commander products such as Distant Kingdoms, these empires, ships, and weapons are not available to players of Federation Commander. To give you a preview of them (and help veterans of Star Fleet Battles transition to the new game system) we published Booster Zero with one ship and a few weapons from these empires. Stock #4200, Retail Price $9.95. To buy a copy now, click here. New Game Value: Six new ships from new empires with new weapons. Lyran Tiger cruiser with expanding sphere generators; Interstellar Concordium Star Cruiser with its plasmatic pulsar device; Hydran Dragoon Cruiser with Hellbores, Fusion Beams, and Stinger fighters; WYN Black Shark with optional weapons mounts. This product also includes the original playtest ship cards and rules for the Romulans, Gorns, and plasma torpedoes. New Empires: Lyrans (Lynx-humanoids, Klingon allies against the Kzintis); Hydrans (methane-breathing tripeds constantly at war with the Klingons); ISC (aloof an enigmatic; they think everyone else is insane); WYN Cluster (a tiny enclave filled with renegades of the Kzintis, Lyrans, and Klingons; plus some Orion pirates). This product requires Romulan Border or Klingon Border for use. Components: six full color double-sided laminated ship cards, rule booklet with new weapons rules. Who will buy it? Veterans of Star Fleet Battles, players of Federation Commander, fans of Star Trek, and fans of miniatures starship games. 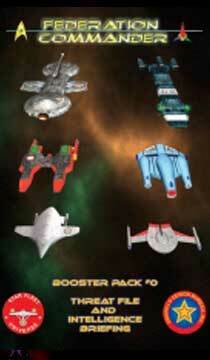 Squadron Box Zero provides one each of the six pewter scale miniatures to match the ship cards in Booster Zero. Stock # 4300; Retail $34.95. To buy a copy, click here. Klingon Border or Romulan Border include all required rules for the ships in Booster Zero, and Booster Zero will only work if you have one of those products.